Denial is a complicated issue, involving the intellect, the body and the emotional make-up of the excessive drinker. Many alcoholics spend months, years or even decades, denying that they have a problem with alcohol – in fact some spend their whole adult lives in denial. Denial is a psychological condition, but it can be supported by physical and emotional evidence. A heavy drinker may, for example, say they don’t have a problem with alcohol because they’ve had their liver checked out and it’s fine, or because they hold down a demanding and stressful job so they can’t be an alcoholic or ‘somebody would have noticed’. This links denial to another strong enabler of alcoholism, which is maintenance. Many excessive drinkers can ‘maintain’ their standard of appearance and performance in public for many years, so that friends and colleagues are often shocked to discover the level of drinking they indulge in private. Family members may be aware of a less ‘maintaining’ standard of behaviour when the alcoholic relaxes his or her guard, but the drinker is usually committed to keeping up the appearance of sobriety to the wider world. Unless a problem drinker can accept and admit that they have a problem with alcohol, they will almost certainly not be able to take the necessary steps to moderate their drinking or to abstain altogether. While they may make temporary efforts to control their drinking, they will not be committed to the process unless and until they wholeheartedly accept that alcohol is more of a problem than a solution in their lives. 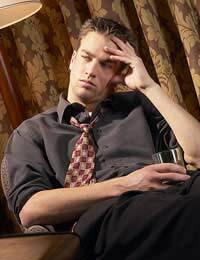 Problem drinkers are also good at hiding the evidence of the extent of their drinking from others – this kind of concealment also leads to denial because what they can conceal from others they are unlikely to admit to themselves. Denial is also an issue because many problem drinkers have a personality type that makes them particularly unwilling to admit a lack of control – they may have rigid behaviours and be unwilling to allow spontaneous behaviour – this personality type makes it even more difficult for them to accept that they lack control over alcohol. Understanding denial is important because unless denial is dealt with, it will be difficult to impossible for the drinker, or their loved ones, to make wise decisions about treatment or the future of family life. The first thing is to recognise that admitting you have an alcohol problem is tough - the courage required to face the effects of excess drinking is immense. Quite often it is many months or years before an alcoholic is willing to recognise what their loved ones have known for a long time. And because denial is part of the process of excessive drinking, there is no point forcing an alcoholic to take treatment before they accept they have an alcohol problem. Instead it’s better to focus on treatment and support for friends and family members, who can do a great deal to support themselves and ensure their safety and wellbeing while educating themselves about the effects and likely outcomes of alcoholism. Also, because denial is a characteristic both of alcoholism and of a certain personality type, removing it is not a swift or simple process – basically the more severe the alcohol addiction, the stronger the denial process. Also, because there are may ways to describe behaviours, it’s easy for an alcoholic’s social circle to believe that the alcoholic is unlucky, prone to bad health, accident prone, suffering from depression, ‘not good at mornings’, obsessive or any number of other conditions that actually transfer the denial from the alcoholic to their family and friends. Many adults only slowly come to realise that a parent or older sibling was actually an alcoholic because family and friends had covered up the behaviour, or made plausible excuses for it, for many years. This is denial in action. The only way to manage denial is to present evidence simply and factually and not to nag or coerce – if the drinker is not yet ready to accept their condition, continuing to insist they should can actually cause them to hide their drinking even more, or to excessive acts of violence or despair to try and protect their need to drink. I'm worried about my partner but feel like a hypocrite for questioning his drinking habits. We both drink, and probably too much. We live together and have no children so we have sort of come to the conclusion that a couple of drinks in the evening is ok. However he likes to go out every weekend with friends/co-workers, (and given the opportunity, I think he would like to do so more more) and he gets very drunk, is often argumentative and rude, then falls asleep and is unable to wake up for several hours. I do not know where he is when this happens as he doesn't communicate with me. I try not to worry about him, but I inevitably do. We have talked about this a lot, but he just becomes so incapable of doing anything that he is so often a lost cause once he decides that he is going out drinking. His answer is always that he is doing nothing wrong and has every right to go out. The responsibility vs irresponsibility is a whole other issue - but I'm not sure if this level of binge drinking is something that he needs help with, or if it is normal for some people to just fall asleep like he does? Am I being neurotic by worrying about this?